I’ve been turning more pens today – I shall be visiting some special friends next week and wanted to bring them something connected with Australia. What better gift, then, than a pen hand turned from Western Australian jarrah. The timber is hard and brittle, but takes a wonderful finish when turned, burnished and polished. I cracked three of the blanks during the turning process and one during the assembly process – so I had to remake the blanks. I wanted to achieve a design that would sit nicely in the hand – a shape that that would mold itself to the hand. And this is what I came up with – what do you think? Even a 50kg weakling can lift 500kg with this device – a new fitness craze? No, more a 14th Century crane for lifting building materials up the wall of a cathedral or castle. 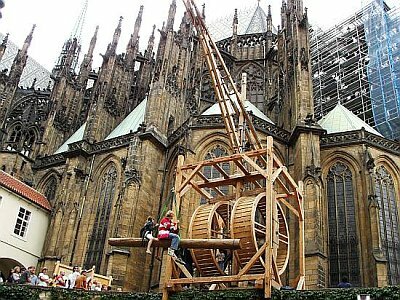 In Prague, a team of fifteen have come together and built a replica 14th century tread-mill crane using traditional techniques and tools. And they are using it to reconstruct a real castle – Tocnik Castle. While it looks cumbersome the whole thing can be dismantled and rebuilt – like a Lego construction – and in this way it can be moved from one location to another around the building site. This one is actually a double treadmill version capable of lifting one tonne of material at a time. That’s pretty impressive for a wooden structure. You can read the whole story or listen to the radio broadcast at the link above. The Virtual Shakespeare Consortium is a consortium of individuals and organizations dedicated to bringing Shakespeare and his culture to the Internet and beyond. Partly it’s about bringing together people from all over the world – virtually – to perform his plays in virtual worlds, like SecondLife. Shakespeare’s sonnets are often forgotten in such ventures, but I think the richness of their imagery and of their conceits would lend themselves to creative treatment in SL, along with sonnet readings in-world. This venture will celebrate the polyglot nature of Shakespeare’s language – he emerged after all, at a pivotal point in the development of the English language, benefiting from the three major language groups that made up English, in a context in which new words were being coined daily and entered the language with the kind of speed not seen again until the birth of the internet.